Hwy 45 to Hwy H, west on H to Edgewood, north on Edgewood to Braatz Dr, west to home. Garage Refrigerator and Freezer, Seller's Personal Property. Hello, I’m interested in 490 Braatz Dr and would like to take a look around. 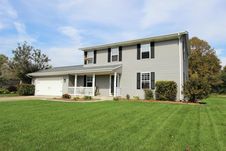 The details on 490 Braatz Dr: This house located in Kewaskum, WI 53040 is currently for sale for $239,999. 490 Braatz Dr is a 2,164 square foot house with 3 beds and 2.5 baths that has been on Estately for 1 days. This house is in the attendance area of Kewaskum High School. Listing Courtesy of: WIREX_METRO and First Weber Inc - Delafield.